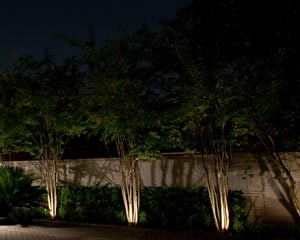 Light-Tech Inc. is Houston’s premier landscape lighting installer and can add beauty and provide security to the outside of your home by lighting up your porch, front yard, flower garden, trees, back yard, street, stairway, walkway, and parking lot. We are electricians and experts at designing and installing motion sensor or timer controlled security lights, floodlights, up-lights, moon-lights, spot-lights, and low voltage lighting. 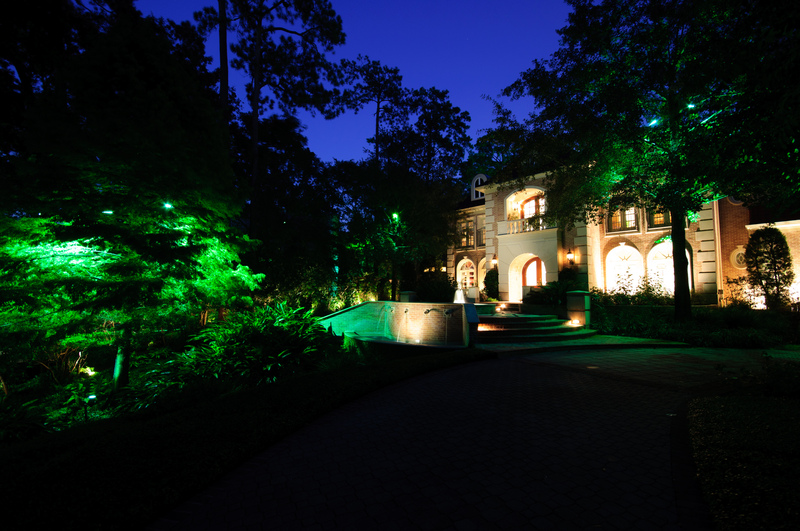 Let our Experts custom design and install the perfect combination of landscape lighting to make your house stand out in your neighborhood just as we have for countless number of other fine homes in Houston and surrounding areas! 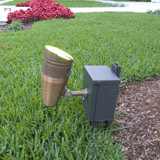 Low voltage landscape lighting is simple yet beautiful. Low voltage landscape lighting is a beautiful, flexible, and cost effective way to add illumination to your landscaping, pathway, or outside walls of your house. You can choose between mushroom lights, up lights, down lights, submersible lights, accent lights, or any combination of the mentioned. 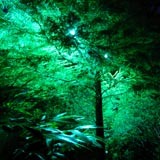 The possibilities are endless with low voltage lights. We only choose the highest quality fixtures from cast brass, aluminum, or our favorite – solid copper fixtures which weather nicely for our landscape lighting installations. Low voltage outdoor lighting fixtures that require a 12 volt transformer to feed the individual lights. Because these lights are powered by low voltage lighting, wires can be used in places where lighting is not possible with traditional line voltage lighting and tend to use less power than their line voltage counterparts. In recent years, we have switched over to using LED lights for these fixtures which use even less power, more light output, and last for much longer and love the results. You will too. For many years, Mercury Vapor lighting was the standard workhorse for high output tree and moon lighting because of the soft “cool” light, they produce. Because Mercury Vapor lights require line voltage and each light is connected to a ballast, installation of these lights were more costly compared to their low voltage counterparts but at the time, there was often no choice as halogens couldn’t be bright enough and had a different color temperature. As great as Mercury Vapor lights were however, they have been in the process of being phased out since 2008 and LED lighting is the future of high output landscape lights. Example of Techlight copper mercury vapor uplight. If you already have existing mercury vapor lights, we are happy to service them but more and more customers are choosing to replace them with far more energy efficient LED landscape lights. If your existing light fixtures are in working condition, we can retrofit them with the proper LED light or replace them with a brand new outdoor LED landscape lights. If you don’t already have any lighting and want us to install high output LED lighting, of course we can install those as well. No matter which method of lighting you choose, Light-Tech inc. is Houston’s landscape lighting installer. Unlike landscape lighting which is used to highlight your home and add beauty without over-lighting, security lighting is meant to deter would be intruders and cause alert. 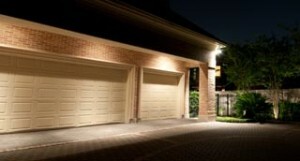 Security lighting can run all night, ,triggered by a timer, motion sensor, or a combination of all of the above depending on your needs. If you have a lighting automation system installed, security lights can also be made to flash if your home alarm is engaged and make it easier for emergency personnel to locate your home.